Tomorrow is Toby's birthday (and, of course, Pi Day), so today was his birthday party over at Abe and Krista's house. The boys had plenty of fun with Toby and another boy from daycare, but they didn't get much of a nap in. Well, no nap. We took off around 2:30 from their place and got home. Meanwhile, my mom is in Madison visiting Nate and Lonnea and my dad has been working long hours for the outage at the plant. So he decided to come over to our place this afternoon to see the boys. He was here for maybe an hour or an hour and a half. Jacob and Reed were having a great time with Grandpa Sam, but running on only a few bites of ice cream for lunch, no nap, and the excitement of Grandpa being here, Reed was getting a little clumsy, which is where the real fun begins. We have this bench in the living room that Reed was running next to, and when he went to give Grandpa Sam a hug, he tripped and hit his lower lip/jaw on the bench - very hard. So hard that we thought his teeth cut through the lip completely (as the inside AND outside were both exposed as being cut). We drove him to the ER, though he fell asleep immediately after we hit the road. He slept all through the approximately hour-long waiting room wait and woke up around when we got to the ER room. They checked out his lip, had the doctor come in, and he told us Reed should really have three stitches to keep it together. 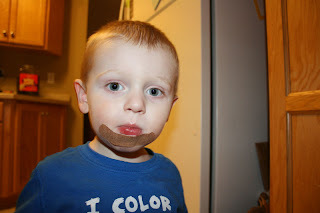 So after another ~45 minutes, they finally came back, shot him with some Novocain (which Reed did not like one bit), gave him three stitches (which he hated only slightly less) and cleaned him up. We went back to Clearwater to pick up Jacob (who was at Doug and Sarah's place), then went home. By this time, Reed was back to his chipper self. He even was playing hard-to-get when I tried to get him ready for bed. And I was just thinking the other day that we haven't been to the ER in a while. That'll teach me.